Wan Hao Chinese Restaurant (萬豪軒) on level 3 of Singapore Marriott Tang Plaza Hotel has re-opened its door after a major refurbishment. 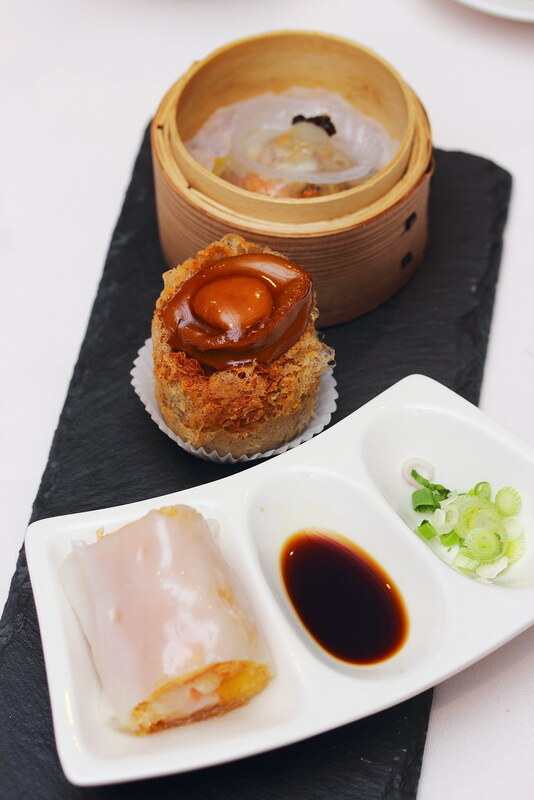 With the relaunch, Executive Chinese Chef Brian Wong Shiuh Yean has curated a new menu, ranging from dim sum to a la carte dishes showcasing classic Cantonese cuisine that are familiar and comforting, yet refined and exquisite with the use of the finest, fresh ingredients. From the new dainty dim sum creations, we tried the Steamed Shrimp Dumpling with Black Truffle and Cordyceps Flower ($6 for 2pc), Crispy Mango Prawn in Rice Roll ($6.50 per portion) and Deep Fried Taro Dumpling with Mini Abalone and Scallop ($10.50 for 2pc). I really enjoyed each and everyone of them. 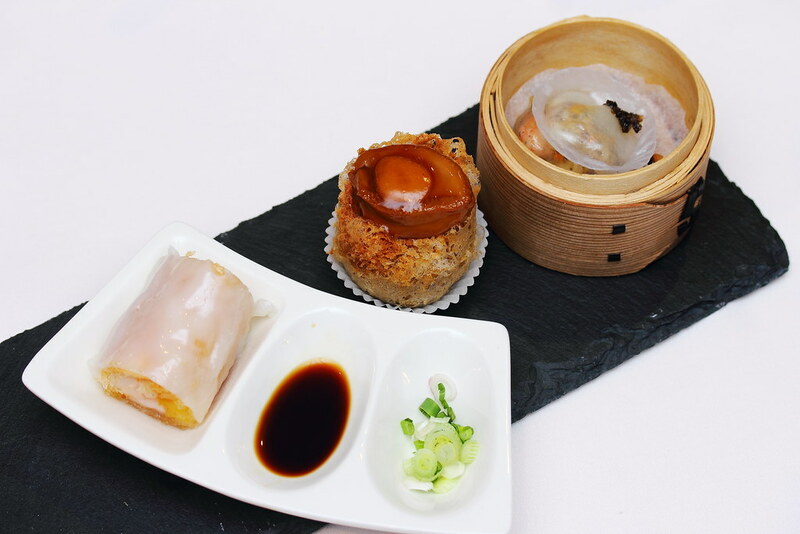 The chef has elevated the enjoyment of dim sum to a more refine level. We were specifically told not to pour the superior soup into the Stewed Bird's Nest with Egg White and Crab Meat ($68 per pax). We are told to taste it separately. 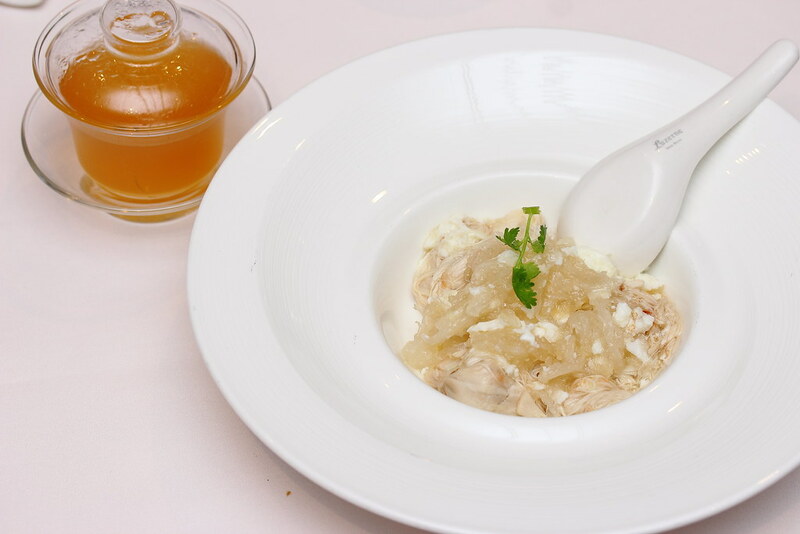 One mouthful of the bird's nest with egg white and crab meat with a sip of the superior soup. It allows you to appreciate the individual components more and how they come together as a complete dish. Deep Fried to golden brown with a thin batter, the Deep Fried Prawn with Black Truffle Mayonnaise ($35 small) was fresh and crunchy. 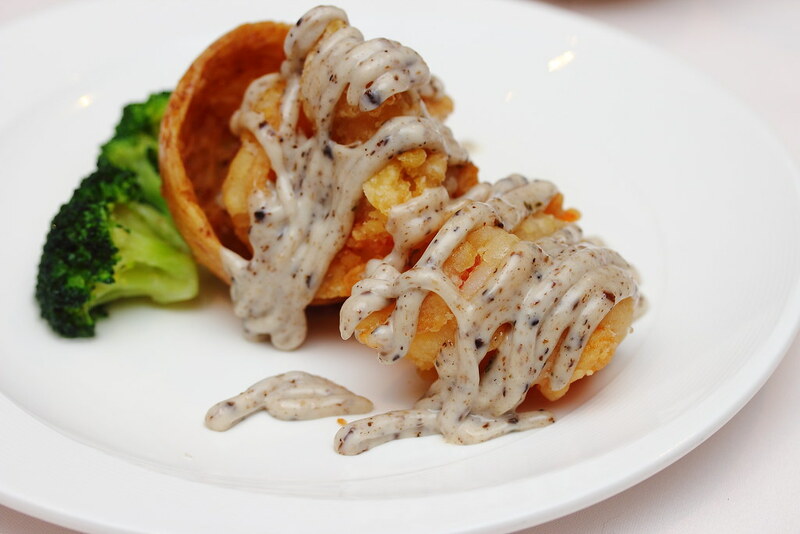 The rich and creamy black truffle mayonnaise sauce is a delectable substitution of the usual wasabi or salted egg sauce. 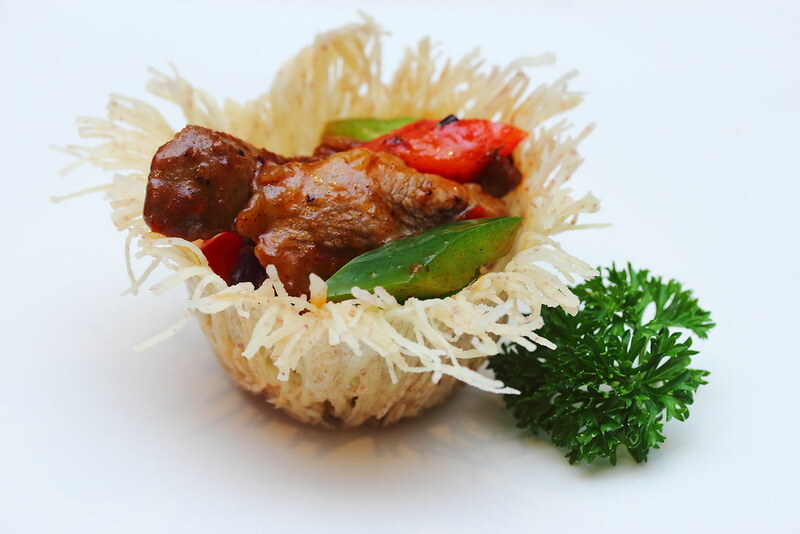 The Wok Fried Iberico Pork with Home Style Spiced Sauce ($30 small) is served together in a yam basket that can be eaten. The iberico pork was not only juicy and tender, it has a robust blend of sweetness and spiciness that is rather appetizing. It made me craved for a bowl of white rice to go with it. 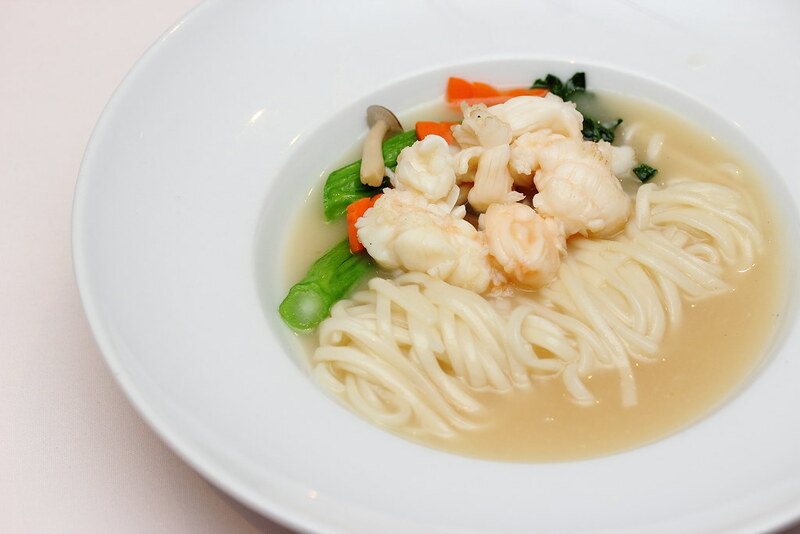 The Braised Japanese Ramen with Lobster Meat in Superior Soup ($16 per pax) received mixed opinions around the table. While some enjoyed the lightness in flavour, others find it on the bland side. I am with the latter. We were later informed that the chef used the porridge water to make the superior soup. Something new to me and it could also be the reason why the soup was on the bland side. Last but not least, we have the Deep Fried Crispy Durian and Chilled Coconut Pudding with Purple Glutinous Rice Sauce to wrap up the sumptuous dinner. 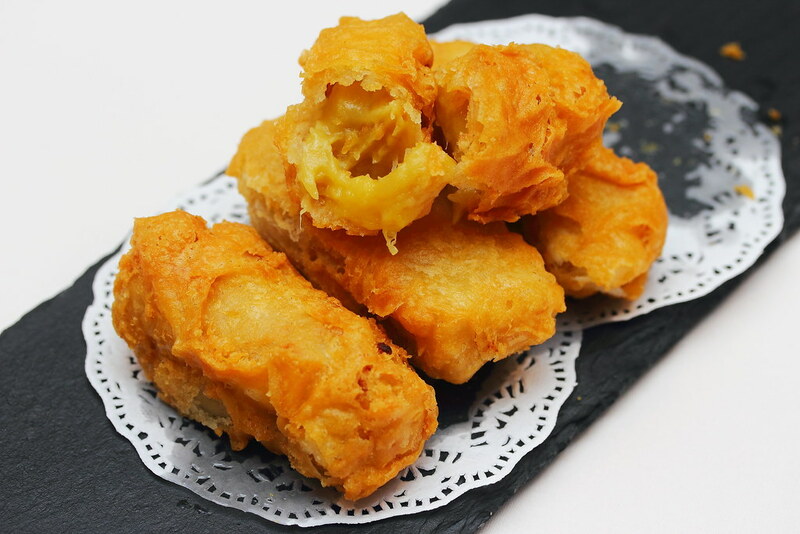 The deep fried durian is simply irresistible with its crispy exterior and sweet, creamy interior. It was pure heaven for durian lover. 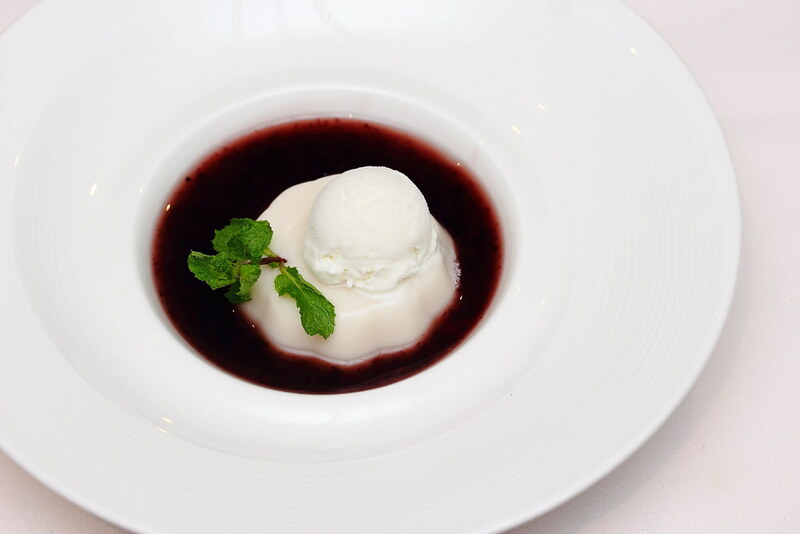 The Chilled Coconut Pudding with Purple Glutinous Rice Sauce is a refreshing dessert which is an modernized rendition of the traditional pulut hitam. I like the idea of the chilled coconut pudding which was made using pure coconut juice. The whole execution was well balanced and enjoyable. Staying true to the philosophy of Cantonese cuisine, Chef Brian focuses using only the best ingredients and its special execution to seduce the palate. He has leveraged on the natural flavours of each ingredient to enable the specialties to shine through, while reducing the usage of sugar, oil and salt, without compromising with the interplay of taste, texture, imagination and presentation.